On the 29th of September, we made Saint Bridget's crosses out of straws in Religion class. It was a very difficult task at first but the more we got used to the weaving the easier it got. For the past few weeks in Religion class we have been learning about 'Celtic Spirituality'. So far, we have learnt about Celtic Society and their Religion. We are currently learning about, St. Patrick and St. Bridget and how the Celtic customs influenced Christianity in Ireland. 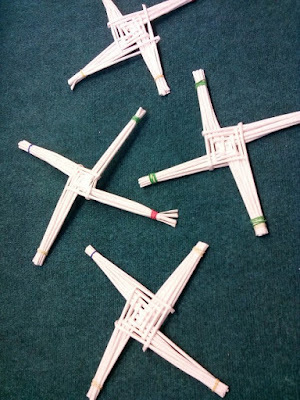 Saint Bridget's crosses are usually made of reeds but we were not able to get enough reeds for the class.